Last Friday I had a whole lot to say before I got to the pizza recipe. Today I'm keeping it short and sweet. Which do you prefer? It wasn't enough to do one (or three) beet pizzas. No, I have more beet tricks up my <hopelessly stained> sleeve. I suspected, from this appetizer, that I'd like the combination of roasted beets and goat cheese on a pizza. I hoped that the addition of caramelized onions would punch it up a bit. I was not disappointed. Neither was my spouse. The kids . . . didn't volunteer to try this one. This is a pretty pizza, all neon-pink beet juice bleeding onto the white goat cheese. Could be cute for a Valentine's day pink-themed meal, if you don't want to go all beet-crusty on your loved ones. I'll try it again when my arugula (rocket) is ready just to see how that looks/tastes. Meantime, the garlic oil was still a nice base for the beets. Preheat oven to 450 degrees Fahrenheit. If you've got a baking stone, preheat it as well. If not ;( just use a cookie sheet which doesn't need pre-heating. Smush the garlic into the warmed oil (I do this in a small bowl). On an oiled piece of parchment paper, stretch out your dough in a pleasing shape. Or the shape that the dough is going to assume whether you like it or not! Brush the dough with the garlic oil. Scatter the beets across the top of the oil. Put dabs of goat cheese artfully around the beets. I'm serious! With muffins I tell you to just dump everything in together. Not so with pizza. Extra points for artfulness. Top with an even layer of fontina cheese. 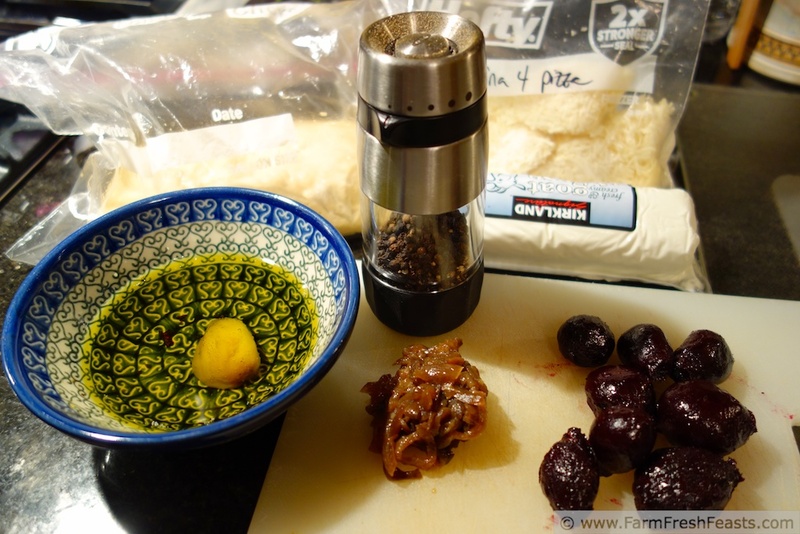 Grind a healthy amount of fresh pepper over top the pizza. Slide the whole thing, parchment and all, into the hot oven on the baking stone or cookie sheet. Bake for 5-8 minutes. Shake the pizza off the parchment, directly onto the stone. Or sheet. 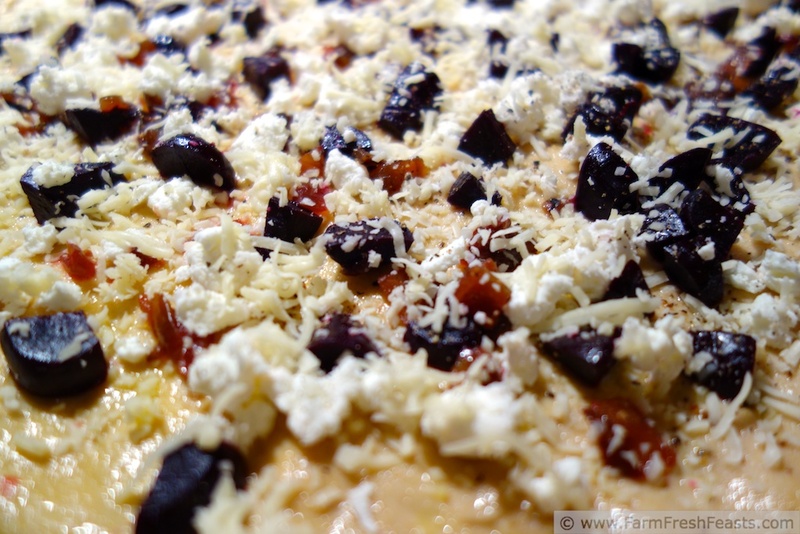 Bake an additional 3-8 minutes or until the cheese is browned and bubbly. Cool on a wire rack, then slice and serve. Enjoy! Now I'm wanting goat cheese and caramelized onions to pair with something new. Done beets, and pears . . . and probably more that I need to review before I check out what else my farm share has blessed us with. Beautiful! I don't always love beets, but you keep making them look so good that I might just have to try this. Have you ever made carmelized onions in the slow cooker? It's so easy and the onions turn out perfect every time. Whoops! Just saw that you did the crock pot onions - I should have known! I admit I'm the beet lover in my family (raw, pickled, roasted, baked) but I'm grateful that my family, especially my spouse, is game to try anything--once. And, yes, I follow Dorothy at ShockinglyDelicious' crock pot onion tutorial! That looks crazy good. I love the flavors of beets and goat cheese together and haven't thought about it on pizza. BTW, I find that 500 word posts work best. Longer and the readers don't stay attached to it. I have to count my words? Ack! My son is a reluctant writer and will point me in the direction of a word counting software so I can easily check my posts. I'm liking Karly from Buns In My Oven's idea best though: "I made a pizza, you should too!" Beautiful and I love the flavor combo. I like a little dialogue at the beginning of the posts because I like your words as much as your food. Wait until this Friday, then, because I ramble in multiple tangents. My husband is a huge beet lover, so this might be a perfect valentine for him! With chocolate, I hope. All valentines need chocolate. Though my spouse must be the only person with the 'eh, I can take it or leave it' attitude towards sweets on the planet. Me, I love them. And beets. Really, I love nearly all foods. Okay the husband loves beets, but I dont care for them. And I actually have tried them recently and still can't acquire the taste. Kirsten, you should link up with my weekly Foodie Friends Friday Linky Party. Just visit noshmyway.com on Thursday evenings 6:00 PM PST and post your favorite recipe and enter our giveaway. A little bird told me that next week's giveaway is sponsored by Lodge, Mfg. Thanks, I'd love to link up. I love beets and goat cheese! This pizza sounds so good, defiantly right up my alley. Caramelizing the onions in the crock pot, genius!! Credit for the genius on the onions goes entirely to Dorothy of ShockinglyDelicious. I just happened to stumble upon her blog while trying to find a recipe. It's so easy, and they freeze great. What a pretty pizza - that would also be perfect cut into small squares as a appetizeer for a VDay cocktail party! It sure would! Of course, I'd have to clean my house better were I hosting a VDay cocktail party! 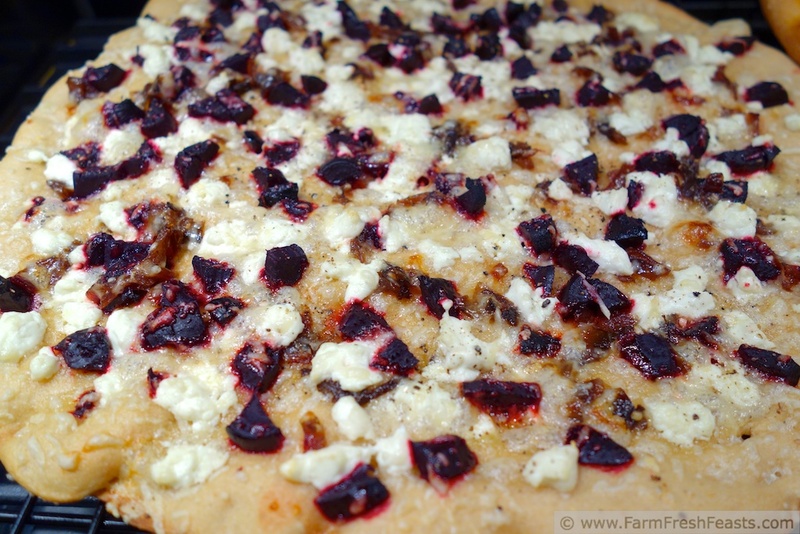 Beets and goat cheese are so classic, I'm sure it's great on this pizza. And adding some fresh arugula on top once yo have it sounds good, too. I've been thinking about making a cousin of this: a fig jam/goat cheese/caramelized onion something: pizza, sandwich, or cracker topping. Got the fig jam today. Lucky you to have a fresh local source! I have a post coming up written after we returned, on a Friday afternoon, from a week long vacation and I couldn't find a lump of fresh dough in a giant grocery store. The post has not published, but I did notice that the store has rearranged their shelves to include raw dough . . . coincidence? That's funny - I think my kids would be the same way! I remember my dad making goat cheese pizza when I was a kid and hating it. But now I love goat cheese anything! That's the trouble with kids--as they grow up, their palate gets educated and before you know it they are eating all of the Indian food leftovers you thought you'd have for yourself! Thanks for supporting local foods through your link up! Beets and goat cheese is one of my favorite combinations, especially in a spinach salad. Love that you added them to pizza with caramelized onions! Now you've given me an idea to put this pizza on top a spinach crust . . . It was a tasty pizza. This looks awesome! 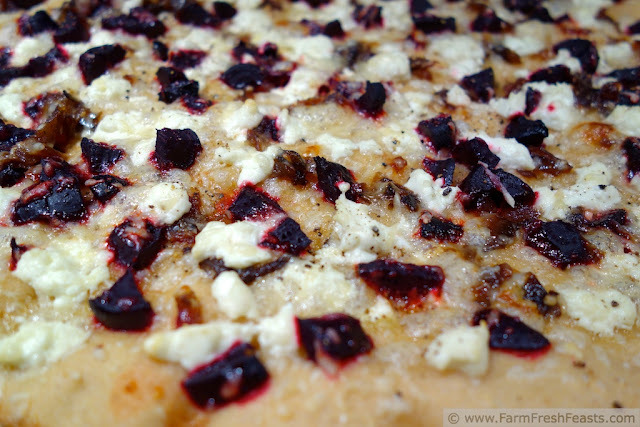 Can't go wrong with pizza, but beets, goat cheese and caramelized onions kick it up a notch! Thanks for sharing!